Metal Gear Solid 3: Snake Eater first released only for the PlayStation 2 back in 2004. It wasn’t until two years later, in 2006 when the Subsistence version of the game came out, similar to MGS2’s Substance, more content was available for the newer remake and basically rendered the first one use less. The biggest problem Snake Eater had that ruined some of the gaming experience was the out-dated camera angling of the game, which hovered over snake and the player would never know what they were walking into unless they stopped and looked into first-person view or used binoculars, and after doing this a few times, it gets very old, very fast. I remember playing this as a kid, already being a big fan-boy for the Metal Gear series being very disappointed with the game and found it frustrating and actually put the game down to not play it for a while. It wasn’t until I purchased the Subsistence version that it was clear to me Metal Gear Solid 3 would be my all-time favorite MGS game. No doubt is the Metal Gear Solid games one of the hardest games to review, but especially Metal Gear Solid 3 in my opinion is the hardest of them all. So much thought was put into this game, the gameplay, the story and plot, every aspect of this game had so much time and effort put into the game that years later I’m still playing the same game I played back in 2004 and still finding ways to make it fun. With the 2011 release of the HD collection that featured MGS3 makes it even better to relive the memories on the PS2 and with the follow up of the PS Vita, Snake Eater 3D allows gamers to play and experience the game in a totally new way. So why is Metal Gear Solid 3 such as unique game? Well for one…it is and always will be a classic, MGS3 was a game ahead of its time, no video game at that time had a story as dynamic as MGS3 and told it as compelling as Snake Eater. What game at that time made you feel really bad about the conclusion, made you want to cry, or made you want to salute all patriotic like Snake does at the end of the game? But don’t get me wrong, there were tons of good games on the PS2 and a lot of them are some of the best games of all time, even till today, but nothing at the time was like MGS3: Snake Eater. Metal Gear Solid games put the players deep into the immersive MGS world and tell a very compelling story. Every MGS game focuses on some type of moral lesson or to make known a situation that necessarily isn’t good, such as nuclear weapons. MGS games serve to be more than just a game, but a lesson and experience through a game, and I think thats the driving force for the MGS titles that makes them so unique. 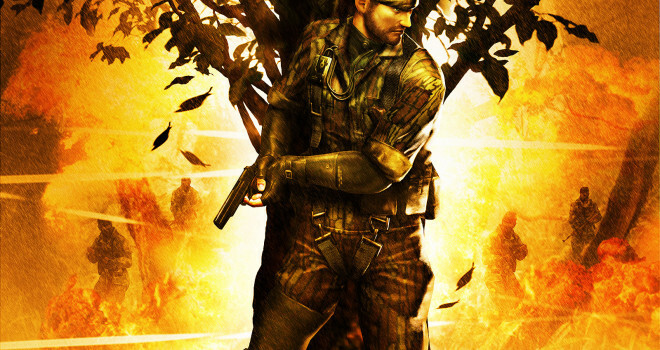 MGS3 features all new weapons and new combat technique to allow the player to chose from multiple methods of taking out an enemy or by simply sneaking past them with the new camouflage index featured in the game and the ability to put different uniforms on Snake so he blends more in his environment. The game mostly takes place around forested areas, so camouflage is key, but if not a forest or grass environment, some type of outside area, like a body of water, on a mountain top or in the bottom of the cave, every area of the game in unique in its own way and makes the player feel as if this is a real environment. Animals interact with the player and the enemies, they are well alive and the background noise of birds and leaf ruffling makes it an even more compelling experience. Snake is now given a stamina bar which the player has to keep an eye on. The higher the bar, the more effective Snake can perform, if he is low on stamina, you’ll hear his stomach growl and his hand will start shaking so it’ll be harder to aim. There are multiple ways of keeping Snake’s stamina bar up, but the most common one is by feeding him anything you pick up in the field, a snake, frog, bird, alligator, fruit, mushrooms to instant noodles and chocolate bars. Metal Gear Solid 3 offers diversity in just about everything, the camouflage you wear, the face paint, weapons and equipment, the play style you chose will effect different parts of the game and the ways you increase your stamina. Theres just so much in this game and that’s why its so enjoyable to keep playing again and again. You really get your moneys worth from this game. Flaws in this game are so minor, that you probably wouldn’t even notice them through your first play through of the game. The AI programming in this game is a little flawed, but nothing that takes away from the experience. The boss fights aren’t very fun, and rather annoying and don’t make sense at times, but they only take up a small portion of the game it again doesn’t take away from the experience. Some of the cut scenes are unusually lengthy and could easily be shortened down, but for the most part, the cut scenes are action packed or emotional that will keep the player compelled to watch it, but if not you can skip the cut scene with a push of a button. Some of the controls when it comes to weapons are also flawed, but the attention of the game is on stealth, not running and gunning and perhaps thats why the controls aren’t as smooth as they could be. Its a story telling game, not a first person shooter. But any of the flaws I can pick at are so small that it barely effects the games performance at all, the only thing that does, or did, was the camera angling in the Snake Eater version that they fixed and isn’t even a problem anymore. Overall, this game is genius, the developers put years of thought and planning in this game to make it was it is now. If you’re the type of player who enjoys a good story and likes a third-person game this is for you. MGS is just one of those games that everyone should at least have tried at some point and played it all the way through. Even the worst game of the series, MGS2, in my opinion anyways, is still a classic and game everyone should try, because the developers of these games take it very serious and always try to make the game a complete master piece. Metal Gear Solid is one of those games that stick with you for a life time.